AVBCW: Motor Quadricycle of Death ! For my barfday, Byakhee Rich got me a present, though I suspect he had ulterior motives as he dropped some hints. Yes, a Motor Quadricycle of Death ! From Zinge Industries. 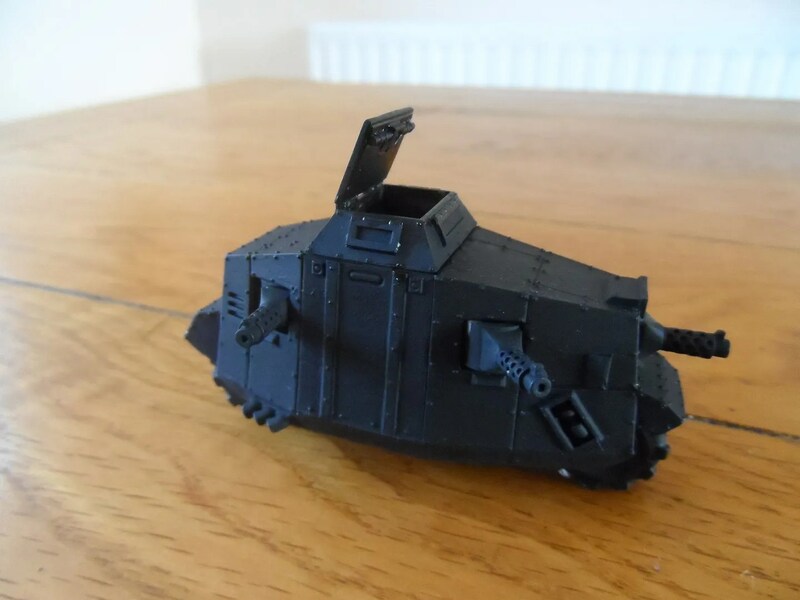 They seem to do a lot of WH40K inspired bits, but as they note on the page this vehicle is inspired by the WW1 German A7 tank. Rich had built it with rotating wheels, moveable HMGs and moveable hatch. 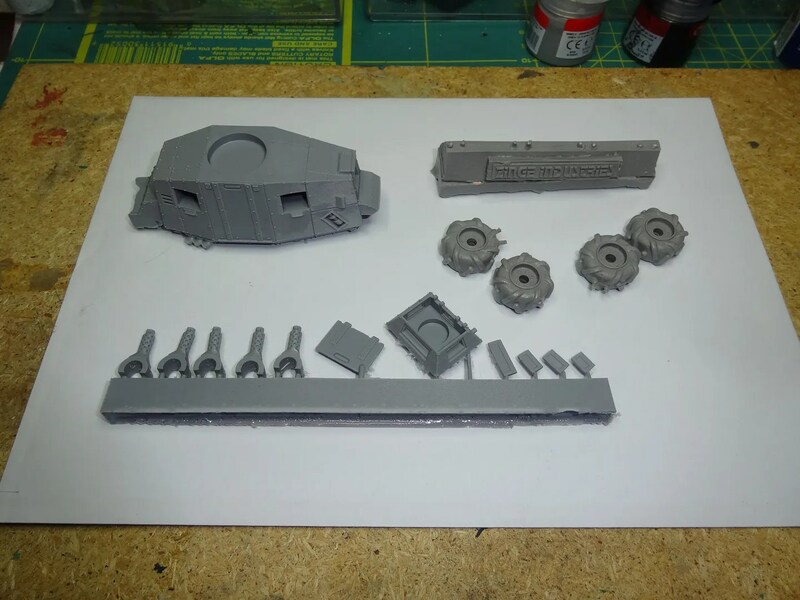 If you bought wheels rather than tracks, that’s heavy engineering so you’d better let me do it. 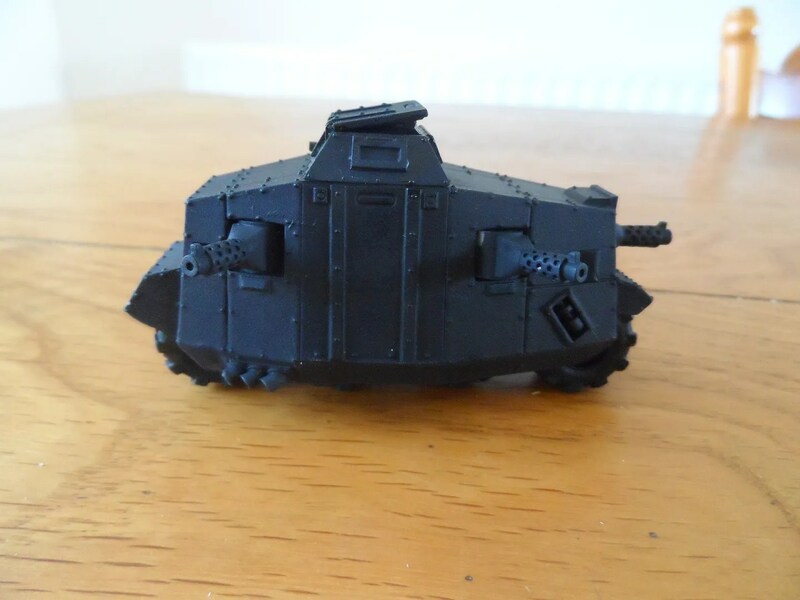 Holes drilled through the hull sides, brass rod axles, milliput and grinding tools for that bit ! 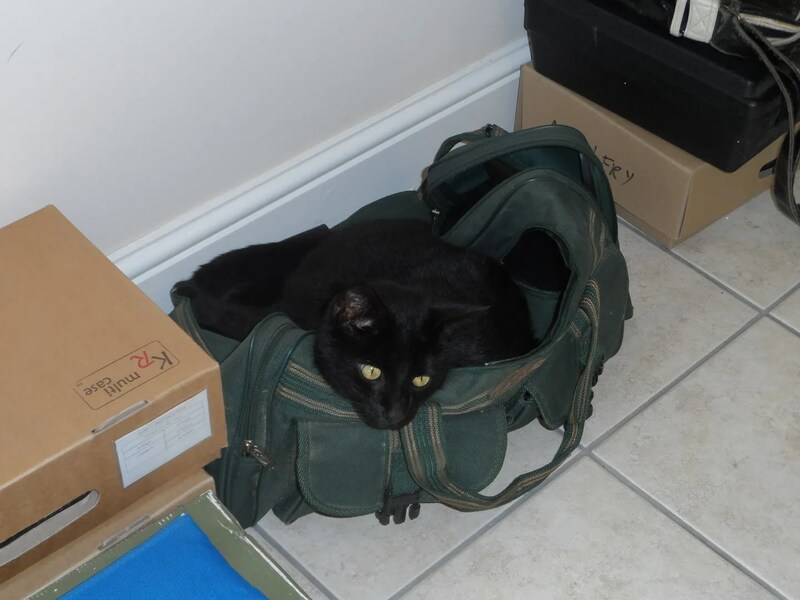 So I have dropped it off with him. To encourage him to complete this task of engineering, I painted the present green and slapped on some MHC transfers, so the MHC can go zipping round the Malverns in this strange vehicle, no doubt built at the Morgan Car factory in Malvern Link. The MHC logo is a transfer, and is about 5mm wide, so a perfect circle isn’t going to happen and looks fine when placed on a table and observed at several foot’s distance with a Mk1 eyeball. 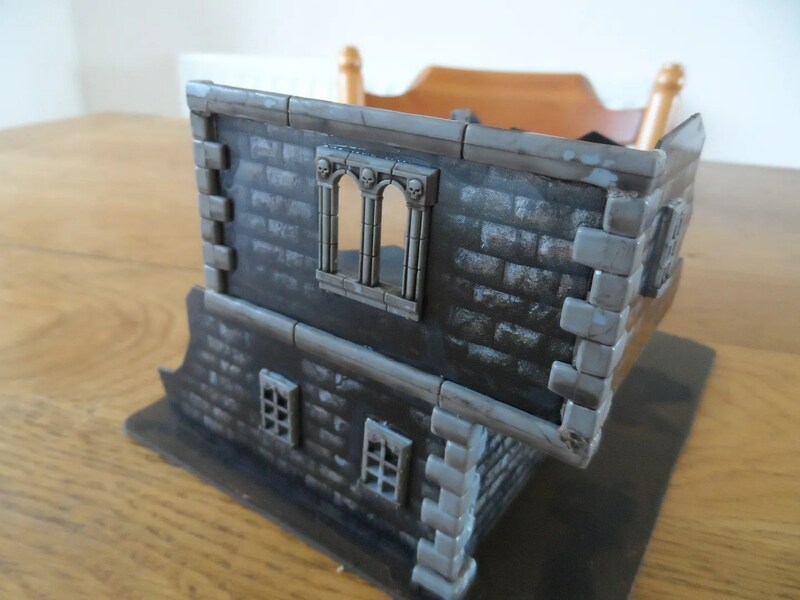 In the Mordheim game in october, I found a building that I’d simply glued on to the artists mounting card and not even bothered to paint it. 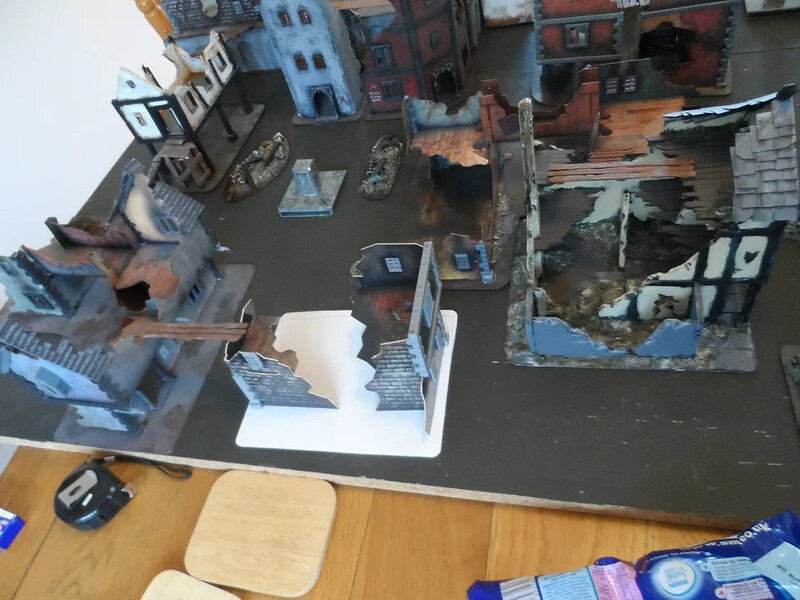 I hastily painted the base before the game started. I then revisited it and over the lasty month in amongst all the other projects, games and life’s issues proceeded to jazz up the base. I used some model railway ballast and some 1/35th scale bricks I had. 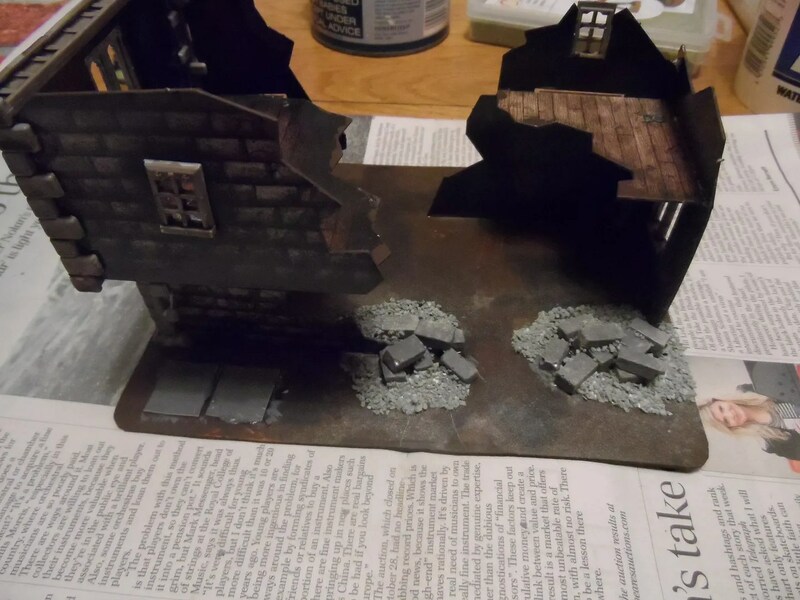 The building was from the Blood on the Streets supplement pack fort Mordheim, chopped up and re-orientated, and I’d used the basic plastic corner pieces and windows. So I did a simply wash (GW Nuln Oil) followed by a highlight of grey to pick out the details (skullz !). 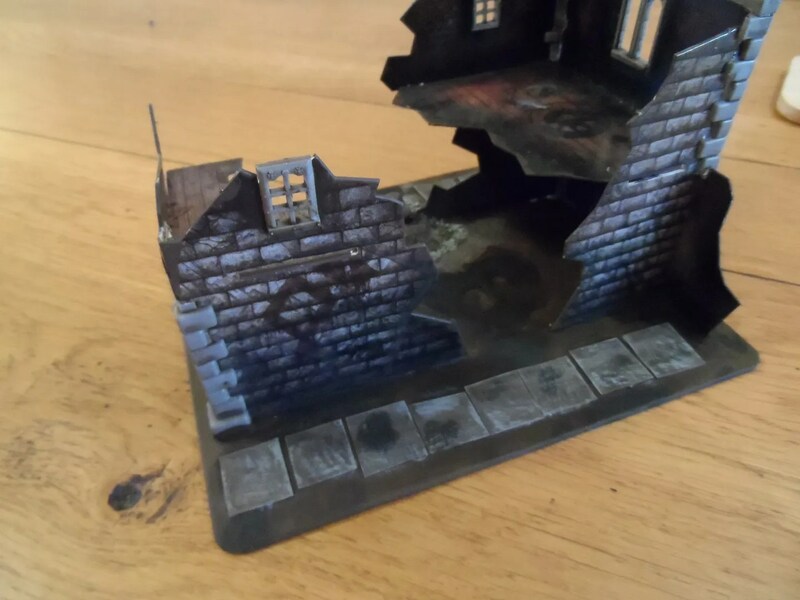 The paving stones were just thin card chopped up, again washed with brown and green washes (again GW whatever the latest names are). And then a final highlight. Ok, so I got caned by the dwarf alliance and their insufferable organ gun firing line. Even running pell mell at them still resulted in a huge number of casualties. Iron Curse Icon was useful in minimising the number of casualties for the Silver Talons, but that is a one off commodity. 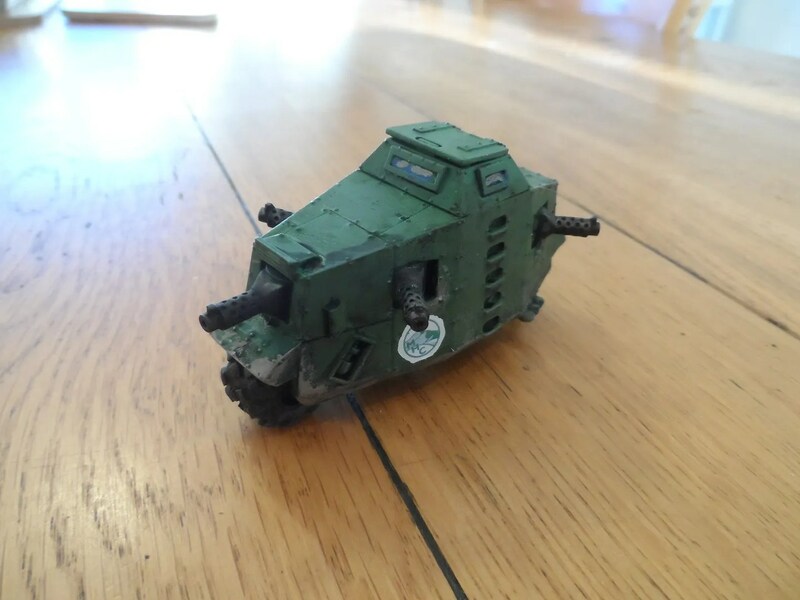 At least the CoK got into combat by being more aggressive and not hiding. 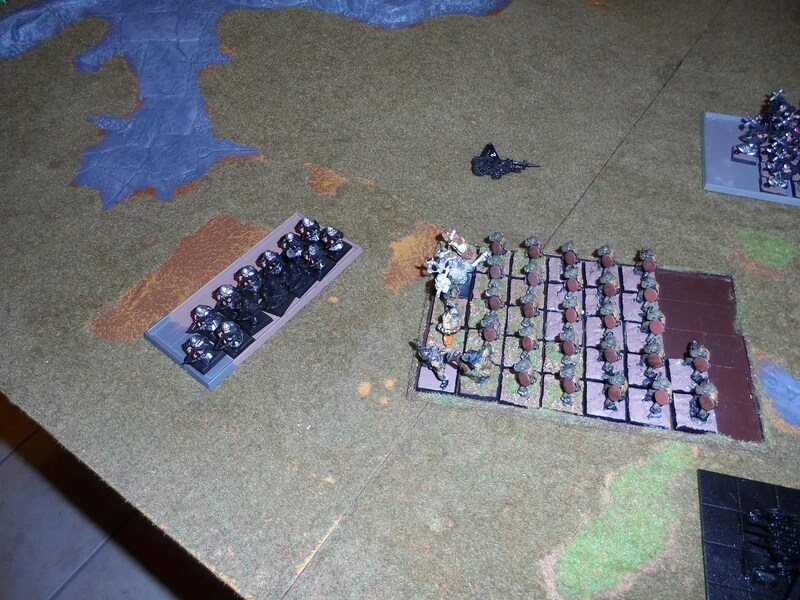 Having two units (of 8 and 6 respectively) helped distract and split the enemy fire. Something learnt from Richard’s Empire heavy cavalry. 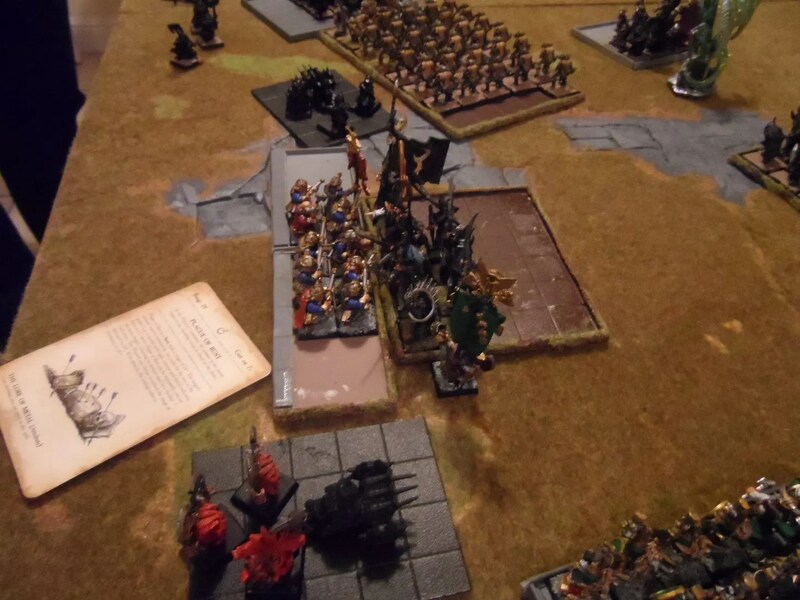 But they need to be better supported, the Orc hordes were not right for that. Dark Riders in units of 10 are too expensive and still too fragile. Maybe units of 6-8 again like the CoK will make them more dangerous and allow me to afford more units. Though the are Rare choices, a small unit of Warlocks with their ward save (4+) might have ben a useful add on. I didn’t invest a lot in magic, and that paid off. Similarly a radical pruning of magic items from the Heroes and Lords made a lot of sense. An interesting set of rules have been made on Druchhi.net to help deal with organ guns, some of them are a bit beardy. But beardy tactics were used in the Challenges during combat which I will have to remember. 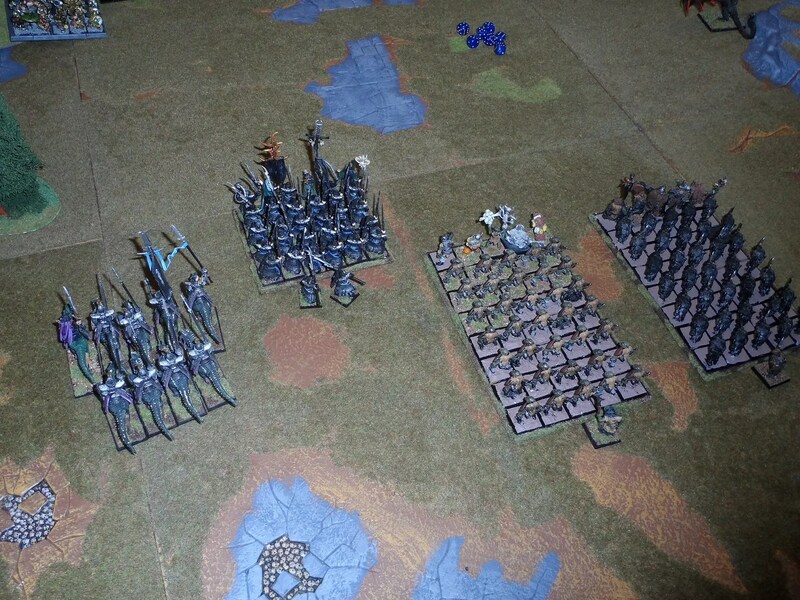 I have at least one PAINTED unit of all the Dark Elf options (except the Scourge Runner, and the new CoB). This enables my adversaries to predict what I will bring. As I have so far only played one army, my enemies are gaining knowledge faster than I, as they play different armies from different games. Anthony & Jim admitted my smaller double unit of CoK was a surprise. 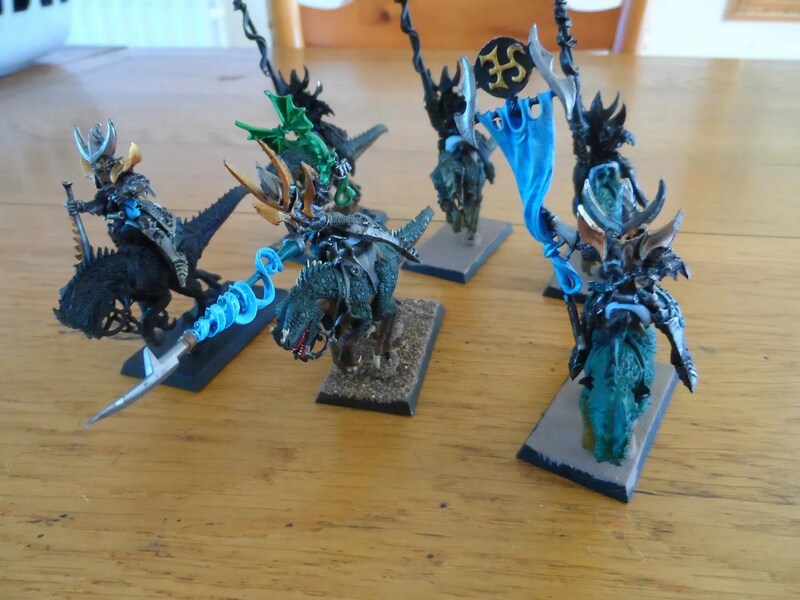 As I am constrained by the PAINTED units I have, this leaves me less room for surprises and variation in my army. The conclusion is therefore to make duplicate units of what I have so I can surprise my enemies. 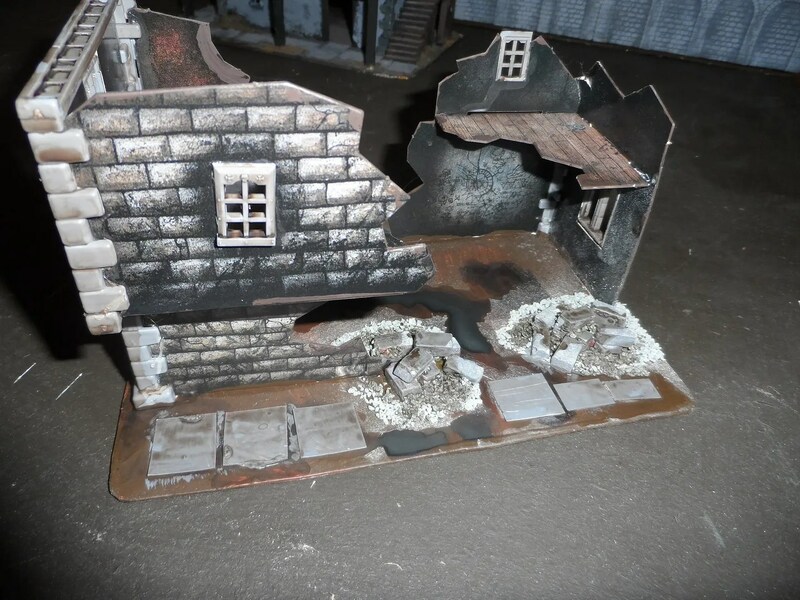 Best paint up some duplicate units like those CoK I had Richard pin for me. 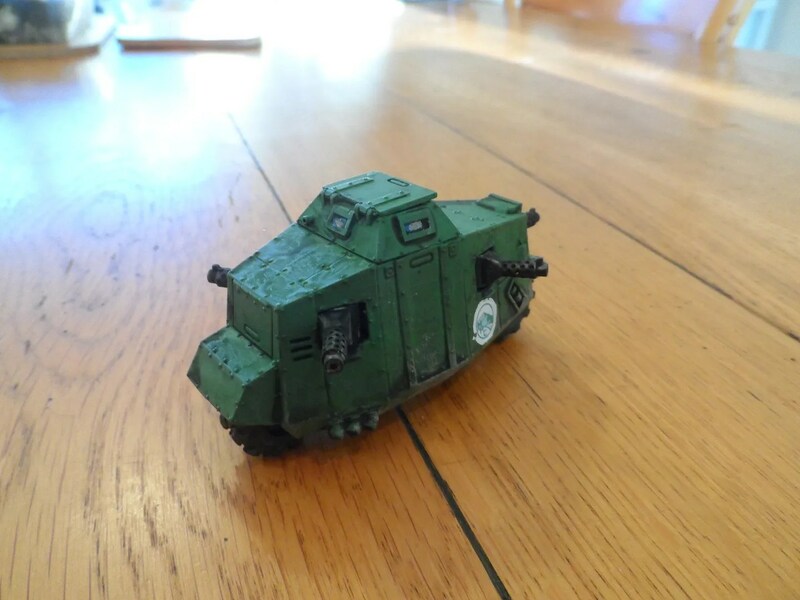 I charged in the remaining CoK and the General, in a last ditch effort to make them useful. the Siulver Talons closed in on their victims. 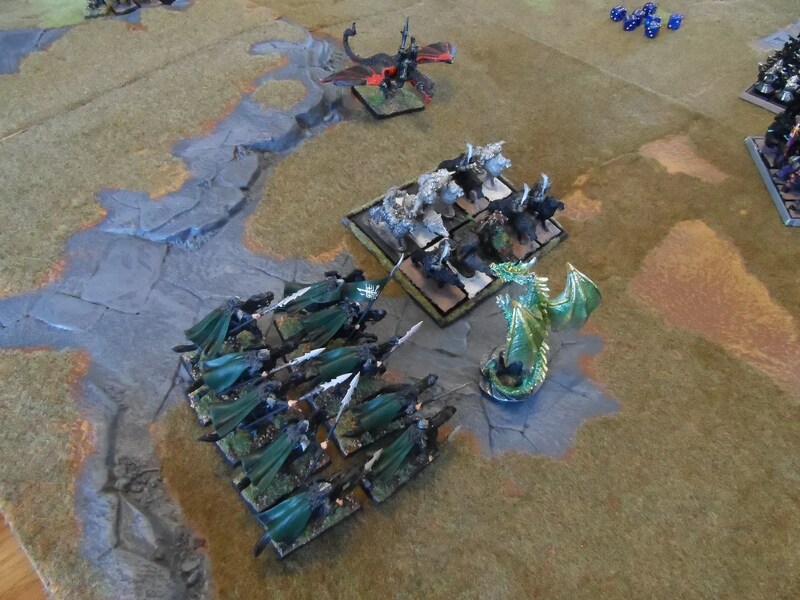 But the general held his ground for another couple of rounds, as the Silver Talons chewed their way through the dwarves. The Orcs finally got into the fray. 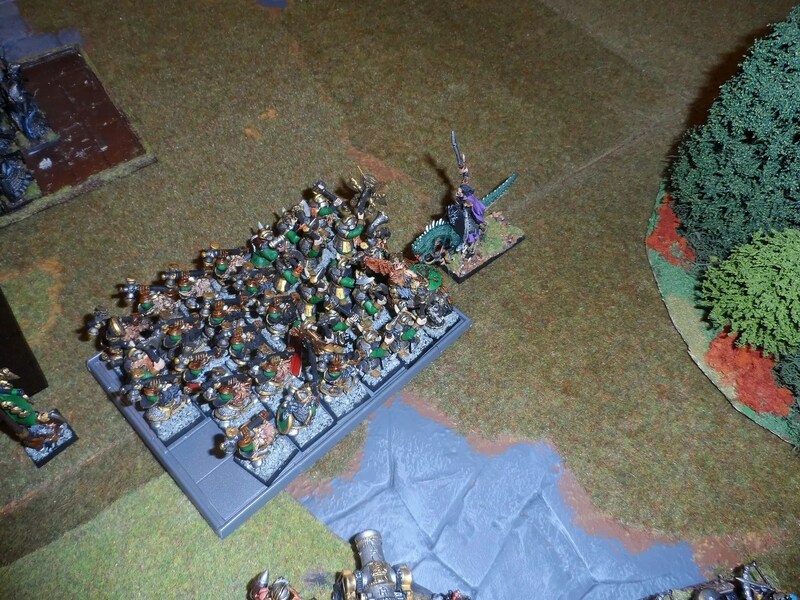 The Orcs steamed into their next target. 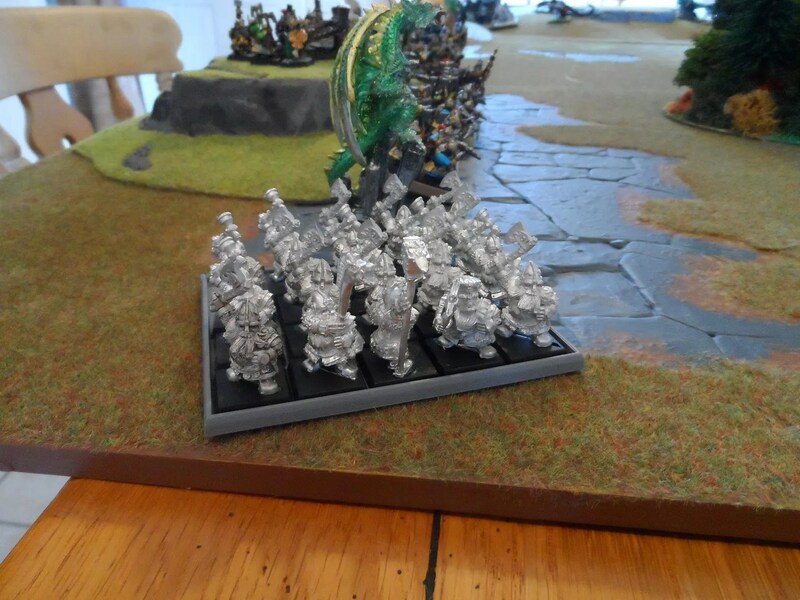 The Silver Talons were side swiped by the Dwarf BSB, whom they did at least defeat in short order. 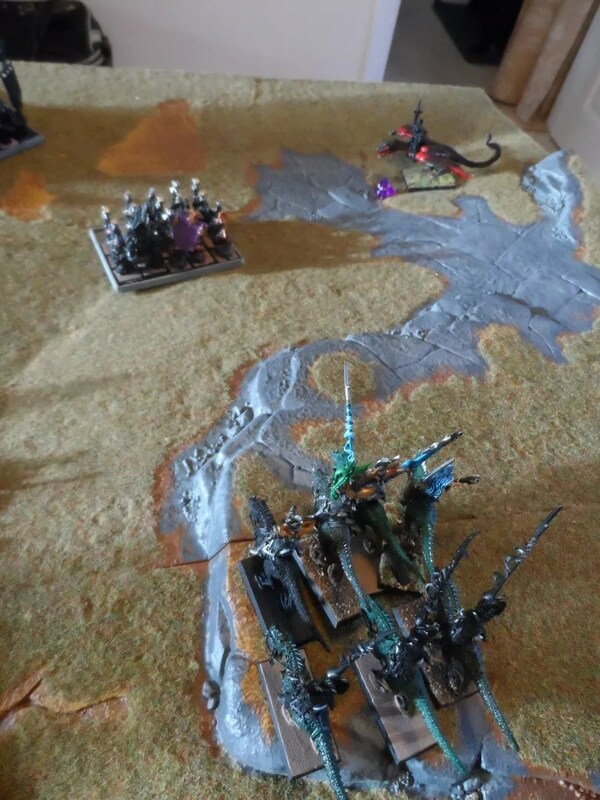 Even if the dwarves had turned out be more difficult to deal with so I zapped them with a hex spell. 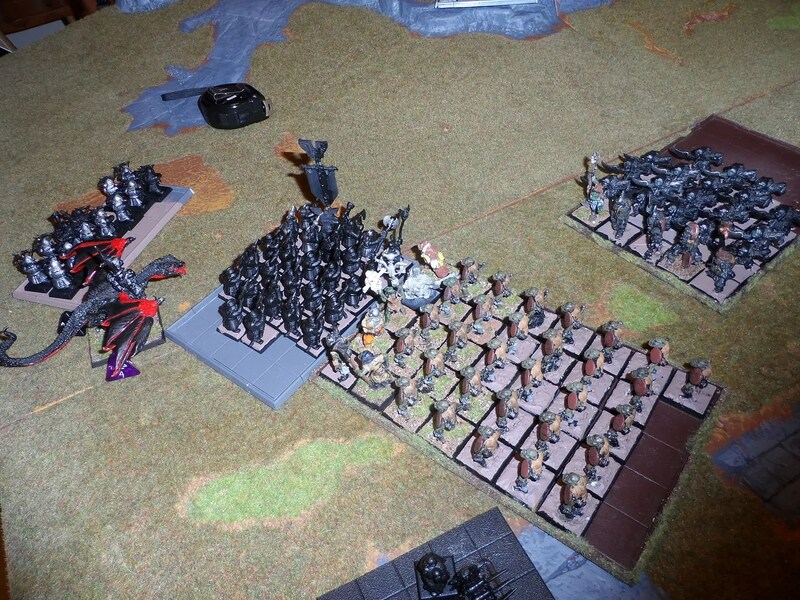 The Black Orcs steamed into their target as well. The Silver Talons finally defeated the dwarves, and came back on the table, as my general was defeated. So a total wipeout, other than my BSB and about 11 Talons and a Sorceress that was all I had left. 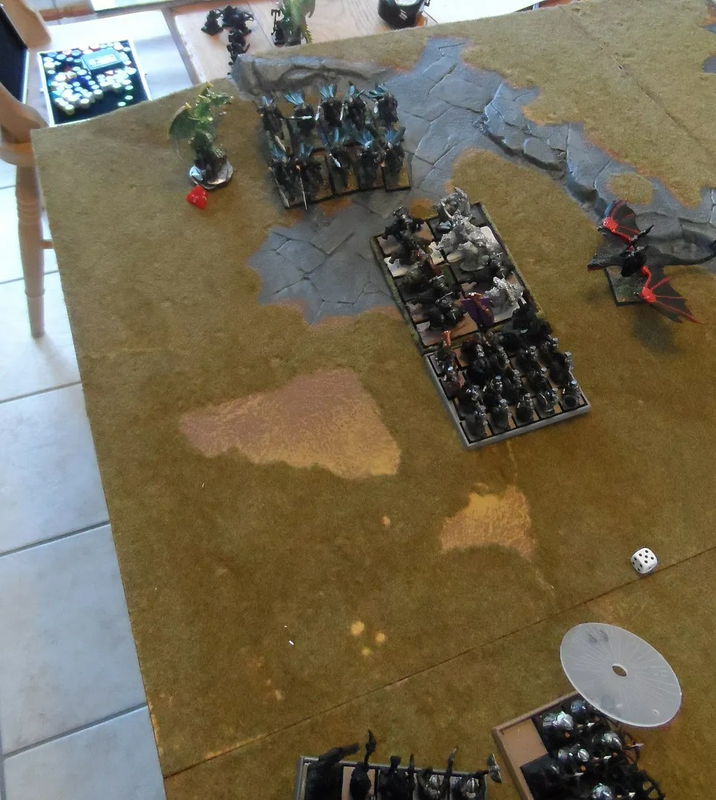 Four of us had a game of WHFB, 4k per side with each player having 2k for their army. 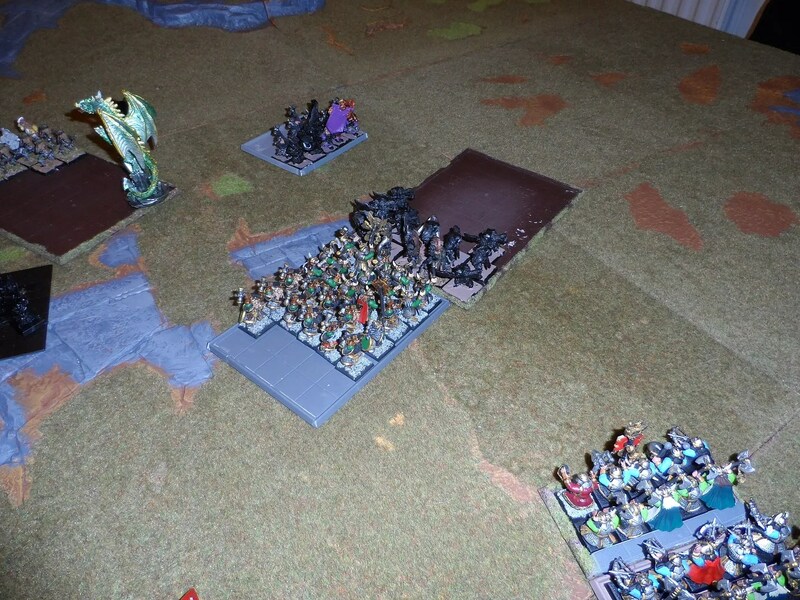 Orcs & Dark Elves vs two sets of Dwarves. Byakhee Jim had been on e-bay a few months back and had a new army to field. 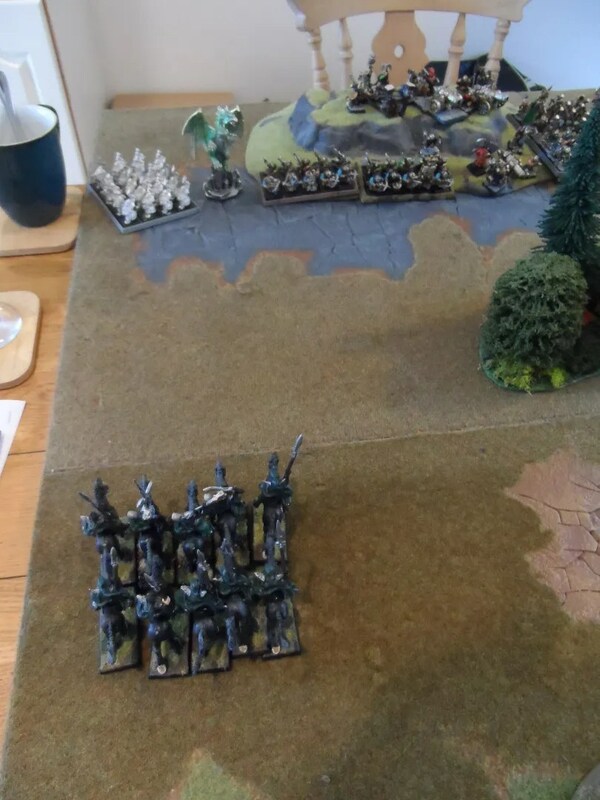 I forgot to take photos of the initial set up, but managed to get the first photos mid way through the first turn. 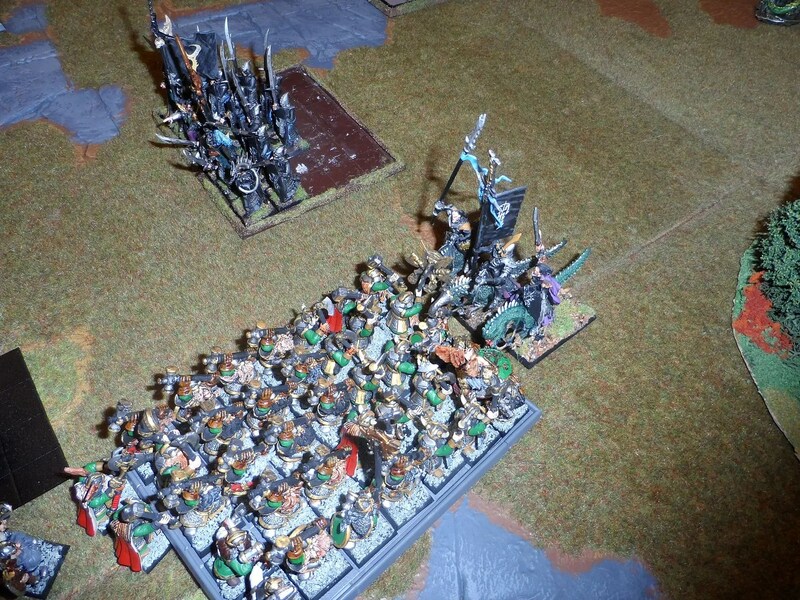 By then, Anthony’s dwarves had decided they Hated us (the DE & Orcs), but we had got the drop on them. 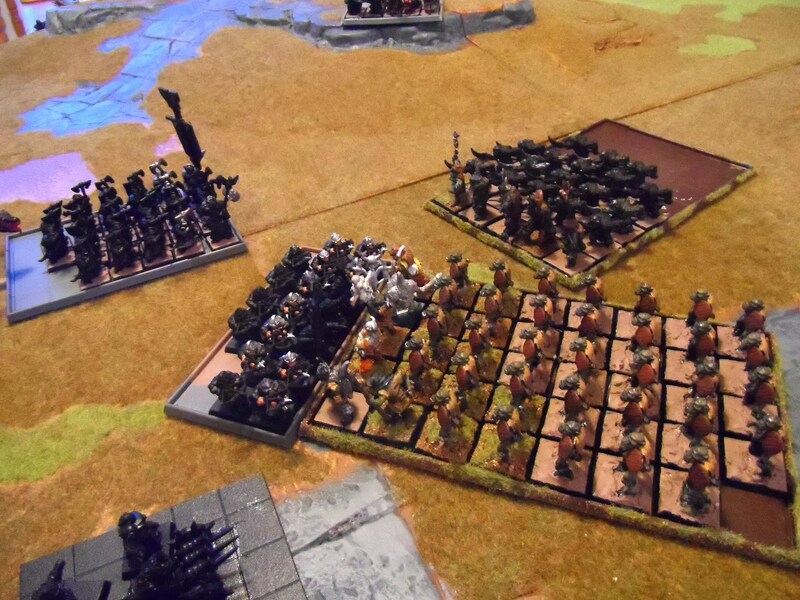 I’d moved a lot of vanguard Fast Cavalry up front, as both Dwarf players had what was essentially a gun line with oodles of Organ Guns. 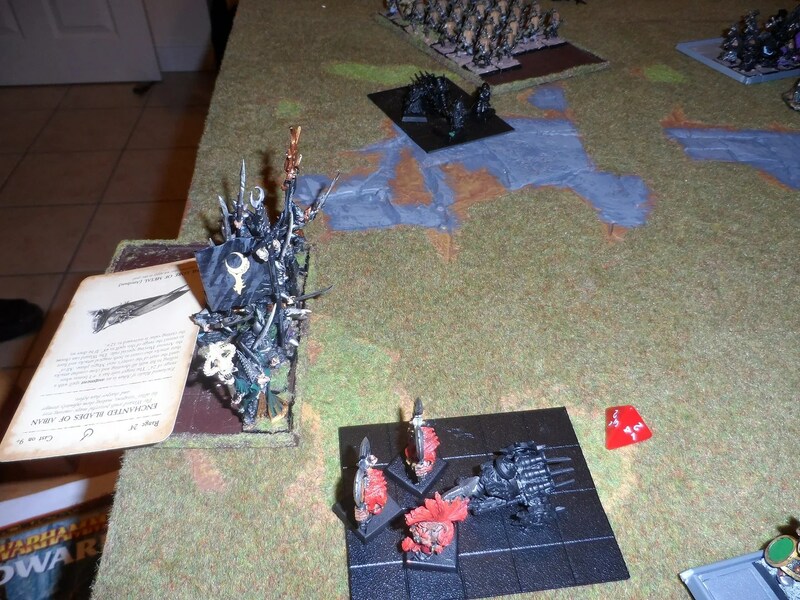 My Dark Elves steamed in ahead of the Orcs – magic standard. I saw no point in sitting there and being pounded into the dirt by organ guns and a trebuchet. And my small CoK unit moved up on the flank trying to catch up with the Fast Cavalry. My CoK were blasted by an Organ Gun but continued on regardless, as were the Silver Talons. 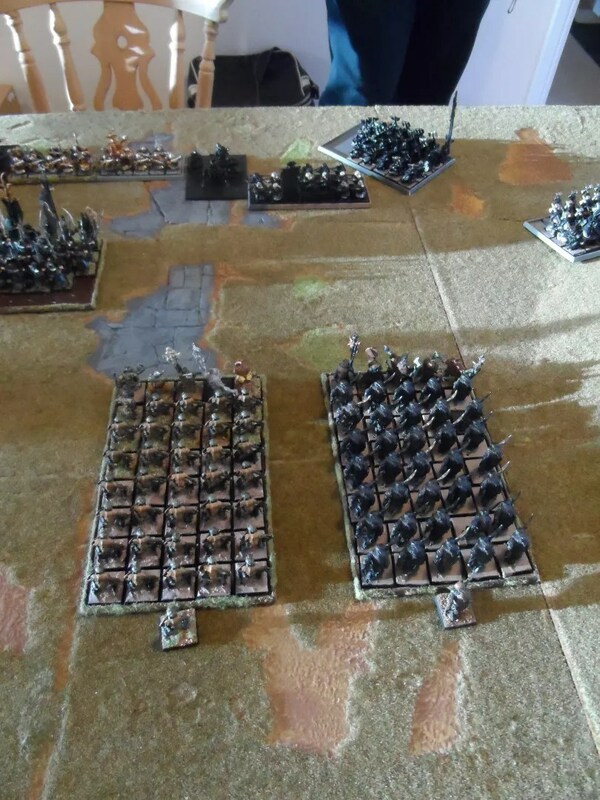 The massed Orc ranks plodded on. At least we had no Animosity nonsense this time. 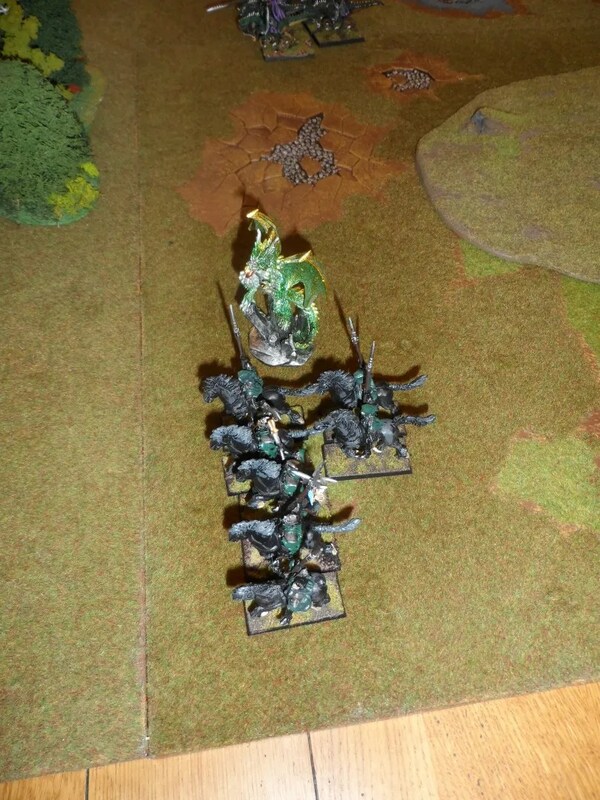 Unfortunately, the Orc Wolf Riders got a side swipe from the Dwarf Hammerers and their General, which along with the Dragocopter rolled up that flank pretty much. 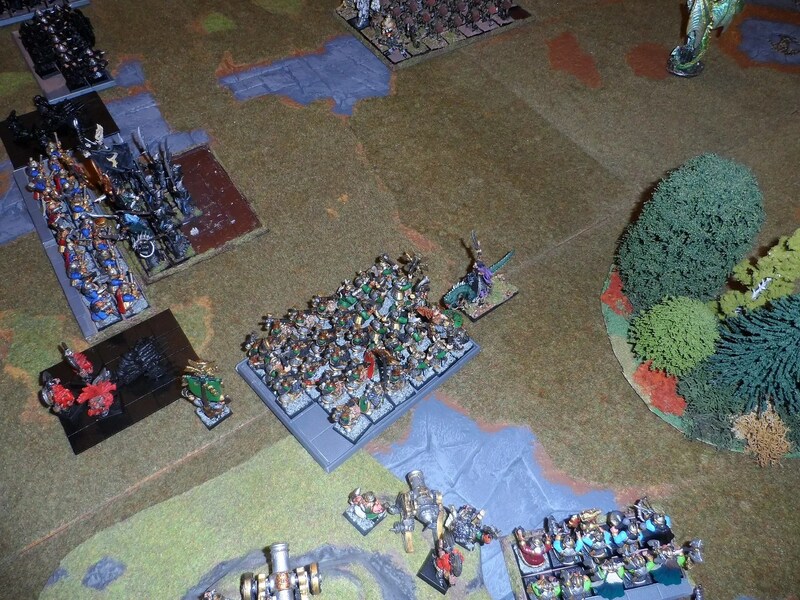 k, not looking good, 6 CoK + Sorceress, vs ~20 Hammerers + General. 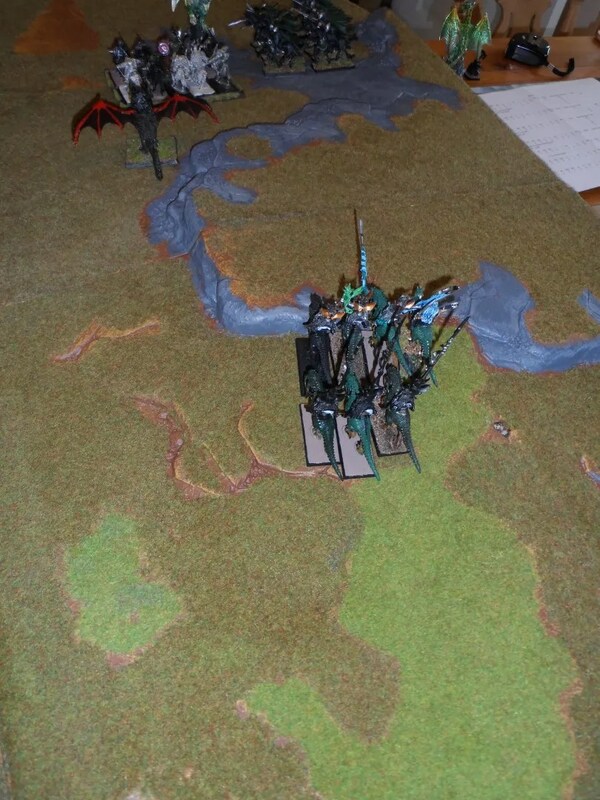 Gav’s Orc HLord on Wyvern had been severely by Jim’s cannon shots as well. 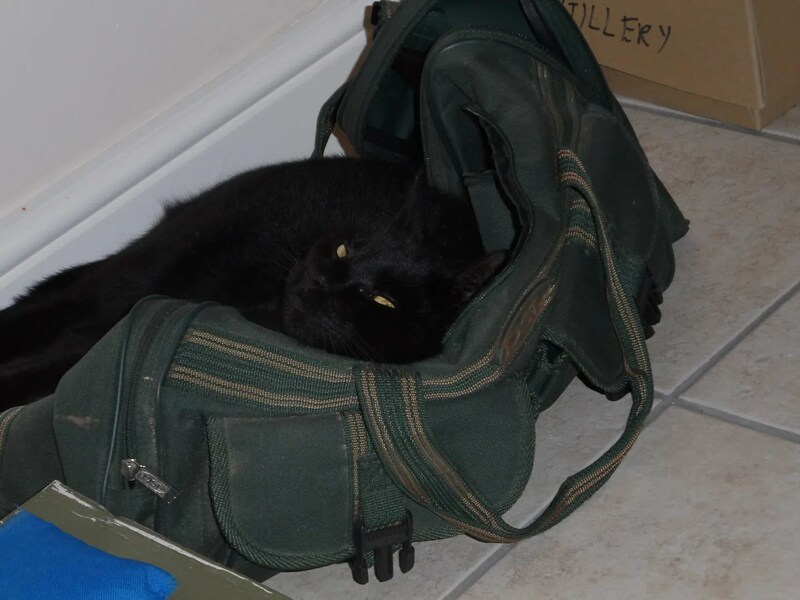 BlackJack in his move, spotted the unattended green bag of Anthony’s and set up residence. More to follow…after I’ve done the council budget !@! No updates for a couple of days because all my projects are 90% done but haven’t had time to do the last dry brush effort or add the transfer. And that’s when the natural daylight is good enough to do anything and the garden fence isn’t about to take a trip into my neighbours’ gardens. 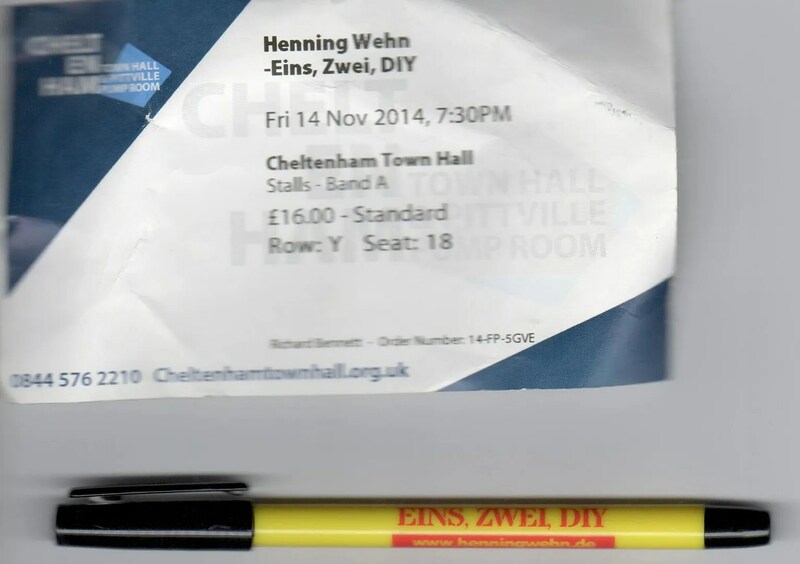 And then Byakhees went out to see comedians and for the second time (for me) Henning Wehn. Plenty of fun on motorways ensued, but we did at least get to see 2/3rds of the show. Still not one for the faint hearted. 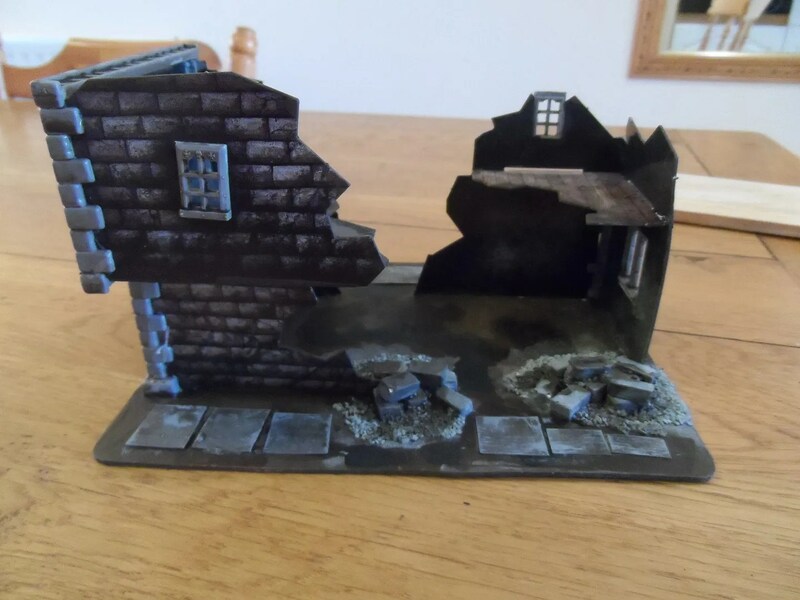 I did however even manage to get some figures from Richard he’d pinned. A bit (!) 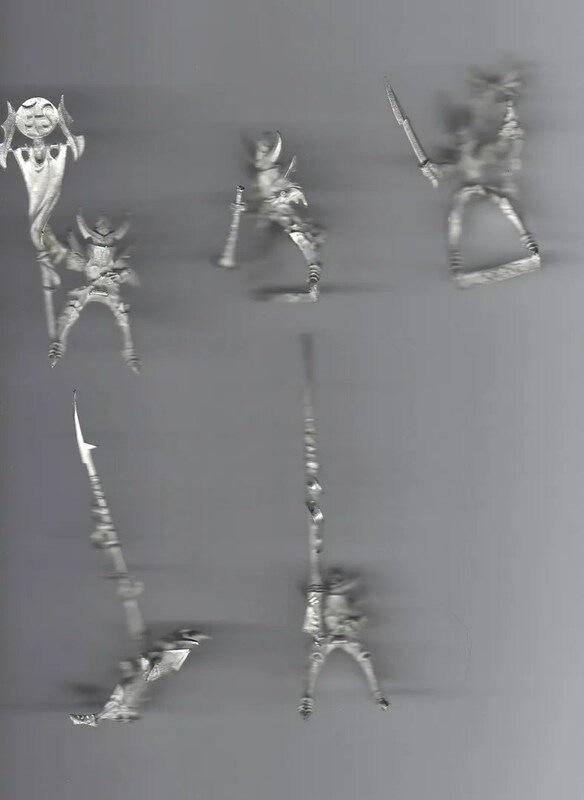 blurry, but my plan is to mount these older metal miniatures on the new plastic Cold Ones to make a distinctive second unit of CoK. I got the extended version on pre-order middle of last week and watched it twice (hence lack of posts last week), it has an additional 25 minutes of footage for the film, and again this is scattered throughout the film itself and there a fair number of discrete new scenes. Beorn gets more of a look in, with the scene from the book of Gandalf introducing the Dwarves in pairs which is a light moment. Mirkwood also gets more air time including the river. 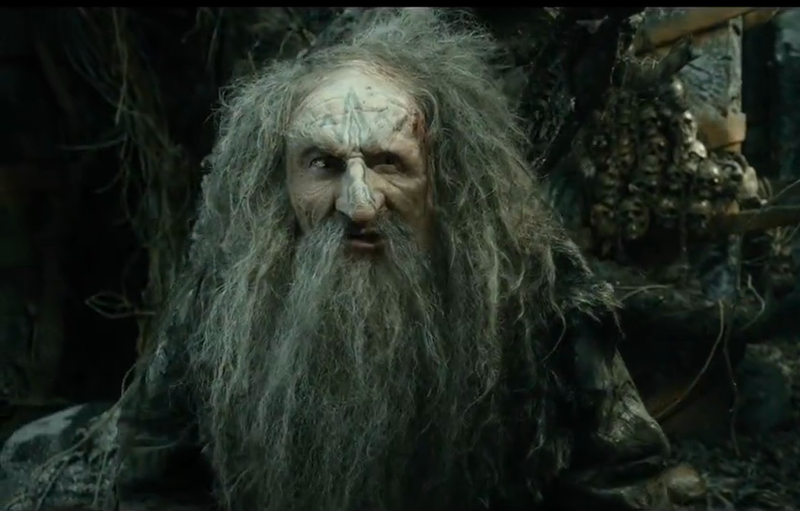 Thrain turns up in scenes at Dol Guldur. Again, not part of the original Hobbit book itself, but alluded to, and then fleshed out in more of Tolkein’s voluminous writings. There are extra bits in Lake Town which are good in further establishing the Master of Lake Town as a venal preening fool, but thankfully not more stuff at the Lonely Mountain itself. So as a film, it is better and actually more in keeping with the back history of Middle-Earth and the general plot Tolkein had, then the original cinematic release. Again it remains a film very much of its own and not a blow for blow recreation of the book as I have commented previously. Bottom line, its worth seeing, and is good entertainment.